A blog devoted to sharing things I've learned related to software. I've recently been working on a Rails project and needed to output some data in spreadsheet format. My client wanted some simple styling of the spreadsheet but the standard colors didn't seem to fit the bill. That's when I discovered that there are other options besides :red, :blue, :green, :cyan, etc. for the background style on a spreadsheet cell using the spreadsheet GEM. Although I couldn't find any reference to these additional colors it is obvious from looking through the source code for the GEM that they exist. Unfortunately, the symbol names used to represent these "additional" colors didn't lend themselves very well to visualize what color they represented. 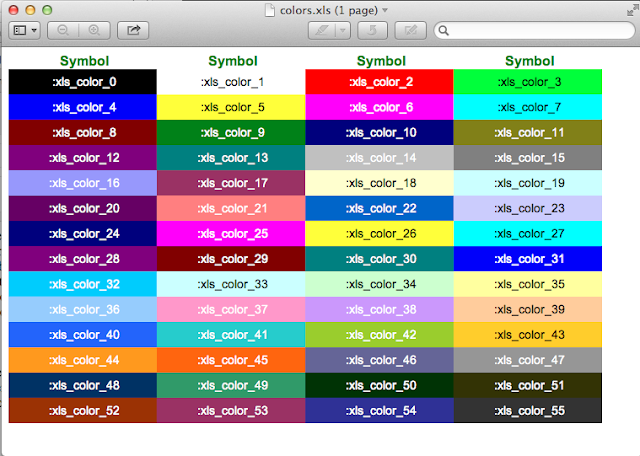 They are :xls_color_0, :xls_color_1, etc... and you can see them by looking at the source code here. A college of mine and I recently upgraded on of our side projects from a Rails 3 and ruby 1.9.3 to Rails 4 and ruby 2.0. In the course of doing so we needed to ensure that all the dependent GEM's we are using were Rails 4 and ruby 2.0 compatible. As is usually the case someone had done the leg work and although not all of the core projects were updated, he was able to find forks on the original projects that had done the upgrades. I immediately tried to clone the project from my terminal window and all worked fine. I thought, GitHub.com must be having an issue but upon checking that out on the status page they were not reporting any issues at all. If I had paid more attention to the details all the clues I needed where right there in front of me but the actual problem still didn't dawn on me until I looked up this post. Turns out the our GEMFILE needed to reference the non-SSH read-only URL for the projects so that I didn't need to authenticate with ssh. Once that change was made bundle install was required but then I was able to successfully deploy our application. Hopefully this saves someone else a few minutes of time troubleshooting similar errors. I've found it useful to have my Rails projects running tests on changes to the source code repositories. It helps to raise awareness to test failures. I use cruisecontrol.rb for that purpose and have found it to be useful. 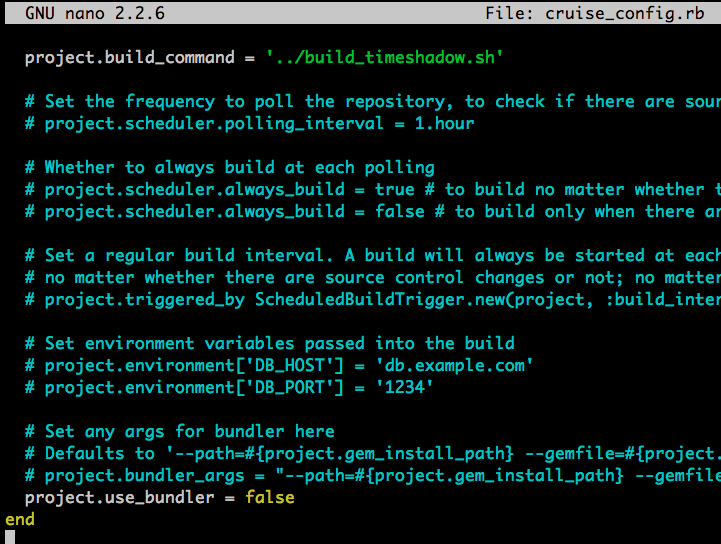 However, this post isn't about the merits of continuous integration, but rather about how to setup cruisecontrol.rb under rbenv and have it build your Ruby 2.0.0 projects. NOTE: The following assumes you have a working cruisecontrol.rb setup and in addition you're using rbenv to manage your ruby versions. First thing you'll need to do is change the cruisecontrol configuration file for your Ruby 2.0.0 project. 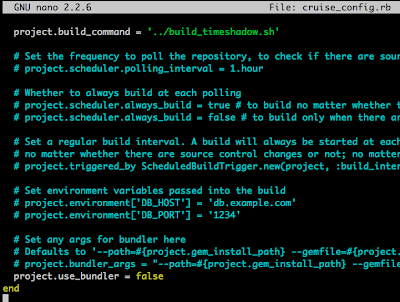 I keep my build file in the same directory as the cruise_config.rb file which is immediately above the work folder cruise control uses to build your project. So you're cruise_config.rb for the project should look something like this at the end of the file. I have the lines rbenv and rbenv versions in my build file so that I can see the log file contains the correct version information. This was helpful while troubleshooting this setup. It's also important to note that since you are using bundler, instead of cruisecontrol.rb using it, that you might find that your project already has a .bundle/config file that has identified where your bundle should be stored. You might want to change that file. I had to in order to make sure that the bundle wasn't setup globally for all projects. and confirming that postgres was actually running. In my case it definitely was running. Several processes were matched. Hopefully this helps someone recover from this issue quickly. Ran across an issue with 1.6.19 of the highline GEM recently. I'm supporting a cross platform development environment for two applications done in RoR. I'm primarily working on Mac OS X while another developer is working under Windows. We are using Ruby 1.8.7 on these applications. Several posts suggested to update to a newer Ruby version which isn't currently an option. It also appears that there will be other issues taking that route anyway. So instead I opted to downgrade highline to version 1.6.12 which was reported in one post to resolve the issue. To downgrade just update your Gemfile to use the specific version of highline. This should get you up and running again. Recently I was setting up capistrano for a new Rails 3.x application deployment. In typical fashion I was adjusting the database.yml file for a new environment but subtly introduced and error. The short answer is: Indentation of your YAML is likely off. At first, the problem wasn't obvious so I ran to Google for help. My search turned up the following post on stackoverflow.com which has the answer but still required close inspection of the accepted response. Hopefully this post helps you resolve something quickly. It is perfect for me. Unfortunately, even with the Microsoft supplied Mac OS X Intellipoint device drivers the keyboard was frustrating to use on the Mac Mini. The most frustrating point was the number pad NumLock key. It simple didn't function as a NumLock. The keypad on this keyboard when attached to the Mac OS X 10.8 (Mountain Lion) operating system was simply always in number mode. I use the number pad to navigate around my code and it simply would no longer work. I was frustrating myself trying to use the keyboard. I would edit code and constantly being inserting 2's, 4's, 6's and 8's. What a mess. Countless searches trying to find a solution turned up many people who shared my problem but NO solutions. I started to contemplate, was it time for a new hammer? I think not! As luck would have it I found an answer! We despite the title it worked for my Mac Mini. In no time at all this genius little utility fixed the issue for me by making the NumLock key work. I was so happy I donated to his cause so he could have a couple beers on me. "Use clear key to toggle "Keypad as Arrow (PC Style Home/End/PgUp/PgDn)"
In addition to that setting there are a few others under this same section that will likely help you out if you're like me and spend a majority of your day using a Windows OS. As always I hope this helps someone with the same issue I was having. This is my blog and an attempt to try and contribute a bit of information for all those who have a life developing software. Hopefully you'll find something useful on this blog, I hate to think I'm wasting time. Have something you need done and done right? 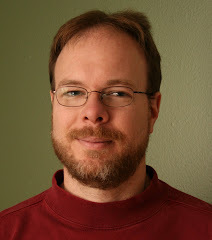 I've been creating software for over 24 years and there probably isn't very much I haven't seen. I can create something from scratch or jump in and try to recover a project gone south. Contact me if you would like some help creating or fixing software.